Vertu, a company committed to unparalleled communication solutions, has pioneered an entirely new category in mobile communication with its signature first introduction: the world's most exclusive personal communication instrument. More than a mobile telephone, it fuses the best in craftsmanship, precision engineering, proven technology, high performance and a unique personal service, into one groundbreaking invention appealing to the most discerning customer. Vertu is a modern classic that is a personal possession to be treasured. Vertu was envisioned by the company's Creative Director and Designer Frank Nuovo. His mission: to apply authentic time-honoured traditions and craftsmanship to proven mobile technology, a category Nuovo has mastered as head of design for Nokia since 1995. In doing so, he would bring artistry and personal significance to an everyday object, elevating it to the level of the finest timepiece. "History has provided inspired examples of dedication to precision craft and design. Our ambition applies this approach to proven advanced mobile technology, creating Vertu's first signature product, and capturing the creative philosophy of our new company," explains Nuovo. For Nuovo and Vertu's team, building this groundbreaking product is the beginning of Vertu's journey of commitment. The instrument's components have been specially crafted in partnership with the world's most prestigious manufacturers - from Vertu's sapphire crystal face to the bezels that come from a venerable supplier of platinum and gold, to the leather that surrounds Vertu crafted from the finest hide. The engine architecture has been developed to ensure trusted and proven performance, through an advanced technology partnership with Nokia. A singular mission drove Vertu's engineers, to build a communication instrument with unparalleled longevity. Assembled by hand in pristine workshops, Vertu's internal architecture features more than 400 mechanical parts, among them 18 jewelled bearings, all inside a case constructed of the finest materials. The effort to create such an instrument alone resulted in over 20 new patents. Vertu's materials meet the highest standards for quality. The sapphire used on the face is a scratch-resistant crystal second only to diamond in hardness. 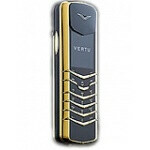 The Vertu instruments that boast precious metals such as platinum or gold are all individually hallmarked. Similarly, key movement ruby bearings ensure the key press is smooth and precise.